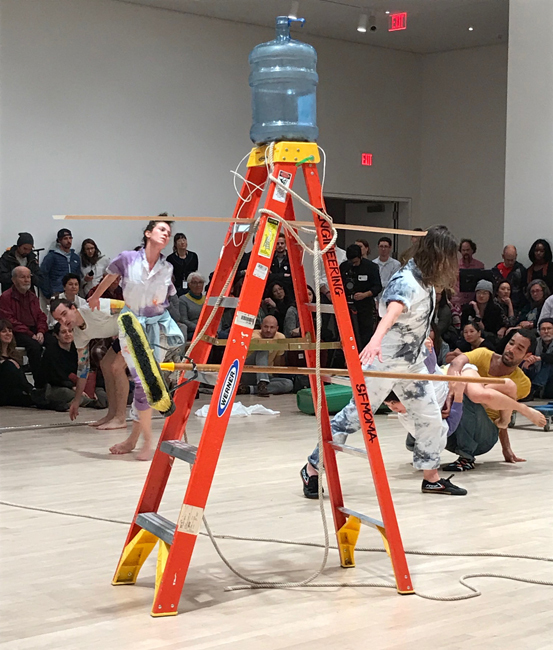 Rashaun Mitchell + Silas Riener’s DESIRE LINES: RETROFIT, performed by Eleanor Hullihan, Cori Kresge, Mina Nishimura, Mitchell, and Riener, January 11-13, 2018, at SFMOMA. Photos: Christian Davies, Gordon Faylor, Claudia La Rocco. 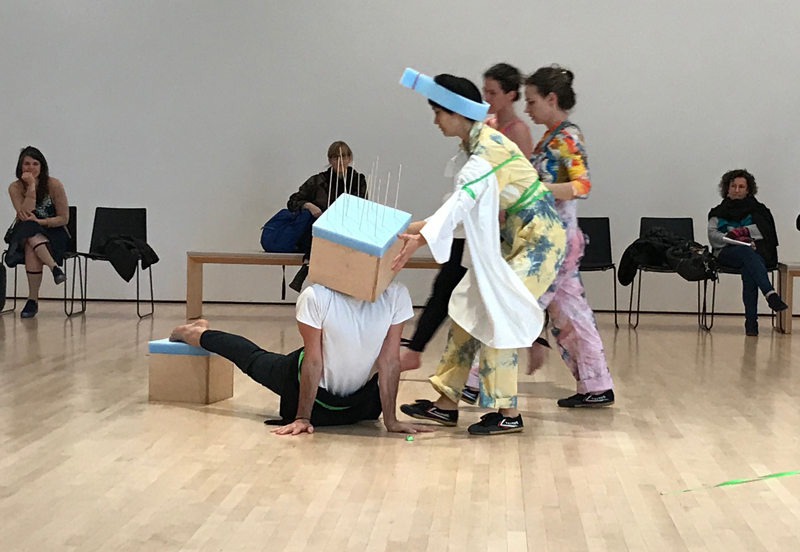 Editors’ Note: We asked the writer and curator James Fleming to attend each of the live moments in the Limited Edition program and create short, visceral responses in conversation with the performances. 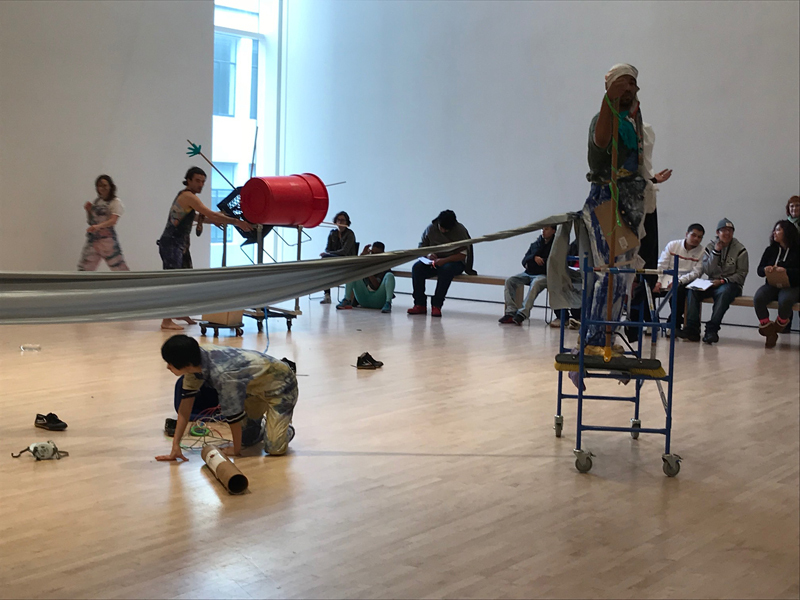 This is the first, written after seeing Rashaun Mitchell + Silas Riener’s DESIRE LINES: RETROFIT at SFMOMA. limbs are made of wood or moving through waterfalls of honey) we couldn’t see. with Zephyrus to the tune of stones jollied in a plastic jug. go go go the dancers through lineage into a roaring absence. — until I make you, make you my own. until chrysalides erupt to brighter forms. until they herd back into meaning. we spook and don’t know how to flee nor fall prone. into use only after disfigurement. but whatever I walked with him I thought forever. — to the path that you have chosen?